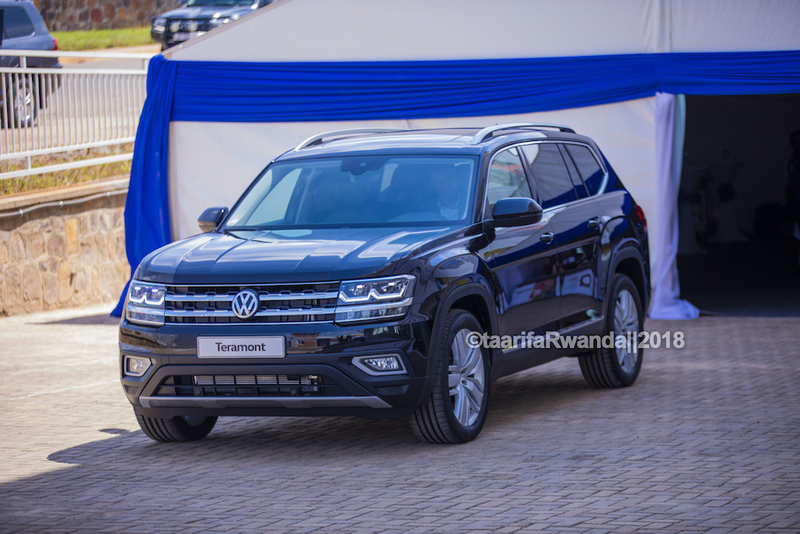 Rwanda is a young modern and digital country and because of that, it is perfectly suited for new interconnected mobility services, said Thomas Shaefer, Managing Director, Volkswagen South Africa at the launch of the assembly plant in Kigali. Let’s look at the technical specifications the German carmaker believes are ideal for the Rwandans and African market. 1. Volkswagen Amarok (48,156US$ (<Rwf42 million): is the company’s first purpose-built pick-up.It is a traditional body-on-frame truck with double-wishbone suspension at the front and leaf springs at the rear. The Amarok range consists of single cab and double cab, combined with either rear-wheel drive or 4motion four-wheel-drive. Amarok has a 3.0 TDI engine and the only bakkie in its class with an 8-speed automatic gearbox. The 165 kW six-cylinder turbodiesel engine with 3.0 capacity has more than enough reserves even in the most demanding situations. Additional power comes from the over boost function which briefly increases the performance of the 165 kW TDI engine up to 180 kW depending on the driving situation. As of 2010, the engine range consists of two 2.0L turbocharged direct injection (TDI) common rail diesel engines which is taken from the Volkswagen Transporter (T5), it has been tuned for more torque but less power; the entry-level version produces 90 kW (122 PS; 121 hp) which develops a maximum torque of 340 N⋅m (250 lb⋅ft) from 2000 rpm. The top-of-the-line bi-turbo version produces 120 kW (163 PS; 161 hp) which develops a maximum torque of 400 N⋅m (300 lb⋅ft) from 1500 rpm –2500 rpm. Fuel consumption in a combined cycle format is as low as 7.6 L/100 km (37 mpg‑imp; 31 mpg‑US) on the rear-wheel-drive variant to 8.1 L/100 km (35 mpg‑imp; 29 mpg‑US) on the 4Motion version, which theoretically gives the Amarok a 1,000 km (620 mi) range before filling up for fuel. 2. Volkswagen Passat (37,674US$) (<Rwf33 million): is manufactured by the company since 1973. The body types offered originally were two-and four-door sedans and similar looking three-and five-door versions. The eighth generational model of the Passat was introduced in November 2014 in Europe and January 2015 in the United Kingdom. Following other Volkswagen GolfMk7, it is based on a stretched variant of the MQB platform, a modular automobile construction platform designed for transverse, front-enginedcars. To reduce weight, lightweight materials such as aluminium and vaccum-formed steel have been utilised. The modern Passat was introduced with a great number of advanced driver-assistance systems, including a semi-automatic parking system, emergency driver assistant which will automatically take control of the vehicle if the driver has suffered a medical emergency. It also has an autonomous cruise control system for highway speeds up to 210km/h. Passat has a collision avoidance system with pedestrian monitoring and variable ratio steering marketed as progressive steering which will adjust the steering gear ratios in relation to the current speed. The engine line-up of the Passat B7 was reintroduced with this generation with slightly increased power outputs, variable displacement for the 1.4-litre TSI petrol engine and two selective catalytic reduction (SCR) diesel engines, with one being twin-turbocharged. It has 8-way power adjustable driver and passenger sports seats with memory function for driver seat. It is also a good sport when it comes to comfort, with eight power-adjustable ways available to make occupants in the front seats happy. For added convenience, there is also a memory setting that remembers just how the driver likes things. Passat has an ambient interior lighting that allows users to take in more of its finely crafted interior even after the sun has set. With its customisable LED lighting. Subtle, glare-free accents on the door sills, footwells and center console not only look slick, but also make it easy to see where everything is around you. Another thing about Passat is that with it, there is no more fighting over the heat or air conditioning. Both the driver and front passenger can choose their own comfort levels. There is also a built-in dehumidifying feature to reduce interior fogging and a pollen filter to help keep the air clean. Passat also has a multifunction trip computer that allows access to a world of useful information, like trip time, average speed, fuel consumption and how long untilyour next fil-up. With radio station display and customisable settings, you can discover your next rest stop. 3. The Polo (23,881US$) (<Rwf22 million) is a compact car, with a traditional transversely mounted engine and front wheel drive. MARK I Polos only came with four-cylinder petrol engines, but for the Mark II, a diesel engine was offered for the first time, although only in certain markets, others have to wait until the launch of the Mark III. The current range includes a variety of three and four-cylinder petrol and diesel engines. Early versions used four speed manual transmission, whilst the current car is available with either six speed manual or five speed automatic transmission. The suspension system on all models uses a fully independent MacPherson strut front suspension, and a Twist-beam rear suspension. Most models use disc brakes at the frontand rear drum brakes, although some recent models have all round disc brakes. The new Polo’s rear design is strong and distinctive. A prominent tornado line extends from the front side panels along the doors and around the rear, defining the bodylines and creating a sculpted, sporty appearance. Newly designed rear lights with LED number plate lights complete the new square-edged rear design, giving real visual presence. The front door design is sporty and athletic, characterised by the long bonnet and horizontal lines, giving a broader, more muscular appearance, while optional new LED headlights with LED daytime running lights enhance its sharp new look. Inside the car, there is a wireless smartphone charger that allows compatible smartphone charging without the use of cables. The storage compartment in the front center console contains a wireless charging pad that you place your phone on top to charge. The advantage of wireless charging is that it is quicker and easier because you do not need to plug and unplug each time. It also looks neater without any trailing cables. 4. Volkswagen Teramont (48,156US$) (<Rwf42 million) : It has a leather-wrapped multifunction steering wheel and shift knob with chrome decorative inserts.It answers calls, adjust the tunes, switch views on multifunction trip computer and more, all from the steering wheel. The Teramont accommodates three rows of seats with ease. Each row is large enough for kids, adults or a combination of both to sit comfortably. The car has 96.8 cubic feet of cargo space, with the second and third rows folded down. It comes standard with seven seats and a third row for kids to sit in. It also has enough technology and amenities to help keep everyone happy. Teramont offers automatic post-collision braking which wrests control of ABS to maximise stopping power when a primary collision is detected by the airbag sensors, halting the car more efficiently than analog machines. In theory, this will help limit the likelihood of additional impacts in case of an accident while minimising initial damage. The Teramont is not screamingly fast, but it is not too thirsty at the pump either, depending on what you are used to. This car is good for EPA combined fuel economy of 11.7 litres per 100km, while accommodating towing capacity of up to 2267 kg. Actually, those are the specs as tested with 3.6-litre VR6 engine producing 276 horsepower- Volkswagen also offers a 2.0-litre turbocharged and direct-injection TSI four cylinder with 235 horsepower. Power is delivered to the wheels via an eight –speed transmission to help maximise engine efficiency and the VR6 iteration of the Teramont can be ordered either as front-wheel drive or with available 4Motion all-wheel drive. 5. Volkswagen Tiguan (37,719US$) : is now produced in both short wheelbase and long wheelbase versions. The SWB Tiguan is available in Europe; the LWB variant is sold in Europe, North America, China, and other markets. For North America, a 2.0 liter TSI four cylinder gasoline engine is mated with an eight speed Torque Converter automatic transmission. In certain markets, namely those where the Tiguan is sold in both 5 seater and 7 seater variants, the 7 seater Tiguan carries the name “Tiguan Allspace”. Volkswagen Composition Media 6.33 Inch Color Touch Screen Infotainment System (A/M-F/M HD Radio, SiriusXM Satellite Radio, Radio Data System (RDS), Apple CarPlay and Android Auto with MirrorLink, iPod/USB Integration, MicroSD Card Slot, 3.5 millimetre (3.5mm) Auxiliary Audio Input Jack, and Bluetooth Streaming Audio), Volkswagen KESSY Keyless Access and Start System, Cruise Control and Leather Wrapped Multi Function Steering Wheel.